Instead of regurgitating this information, we've been allowed to share this invaluable article about Exposure Lamp Types, courtesy of Murakami Screen USA. Without a doubt, the information that you'll find below is not well known, but is ESSENTIAL in running your screen printing shop effectively. Read it, absorb it, do it. Knowledge is not power...implementing knowledge is. Your exposure system determines your success in screen printing. I once owned the finest automatic presses available, had a state of the art computer graphic system, and a sales force that flooded my shop with orders, but never understood why I had so many problems on press. I went through many different emulsions, attended seminars, I knew how it should work but it didn’t in practice. Screens broke down quickly, especially on water base and discharge prints, and the pinholes were everywhere. I made the screens like I always did; same exposure times as always on an old carbon arc unit, but a thousand pieces into a ten thousand piece job the screens died on press, details fell o the mesh, or worse the whole stencil peeled away on a discharge job due that afternoon. I rushed to the screen maker, “I need another set of screens for the discharge job on press three” and quickly walked away. The screen maker pulled some screens out that he just coated, patted the surface to make sure they were dry and burned a new set, developed them, applied hardener, and force dried them in front of a fan. As soon as they felt dry he blocked them out, post exposed and rushed them to press. (See Waterbase and discharge Screen Preparation to understand more about these inks and their affect on stencils.) The press operator quickly set up the freshly made screens and began printing. Three hundred prints later the screens are breaking down again and I am boiling mad as I rush back to request another set of screens while I look up the telephone number to give Doctor Bob an assessment of his Aquasol TS emulsion, @%&*$!)*&^! he hears. Doctor Bob and Walt successfully fixed my mis-understandings about emulsion exposure and more importantly the quality of light used to make the screens. Well most of you are much calmer and nicer, but I wasn’t when I called Murakami. I had a Disney job due, a huge Disney job, the first we had ever done; an eight color discharge of the Beast with three foil colors of the rose in the domed glass cover, the shirts were to be given to all Disney attendees of the Academy Awards and then the rest put into Disney stores for sale the next day and I was shooting sets of screens non-stop, every 500 prints and I could barely shoot screens fast enough to keep up with the breakdowns on press. So I called and gave them an earful, amazingly I now work for them, why? Their products and knowledge solved my problems, and here’s how Doctor Bob and Walt enlightened me, pun intended. Your exposure unit controls your screen print destiny, remember? The light an exposure unit emits can vary a great deal, from fluorescent tubes to an 8k Metal Halide. Just because the salesman said it would expose a screen, and it did sort of, gave you no clue to the quality of light it emitted. Sure it produced a screen, but how well did it expose the emulsion? Like car lots, you can buy a little four banger Focus or the fire breathing Shelby Mustang with 540 horses. Guess which one wins in a race?, no need to guess you know. So exposure units are the same, they either have the horsepower or they don’t. Long exposure time does not fix weak light or a light with limited spectral output. It all comes down to how the emulsion cross links and how complete and organized the cross linking is among the components in the emulsion. So to get perfect screens you need both: a very good exposure system, and a very good emulsion like Murakami, simply the best there is, I’ve used them all, this stuff really works and I say that as a production manager who printed for Disney, Nike, Walmart, Target, Quiksilver and Mossimo. Let’s put it this way, I could fall asleep at night knowing the same set of screens printing a ten color discharge job on the graveyard shift would be printing fine in the morning and still print well on swing shift that afternoon and continue to print for several more days. So what’s the secret? Strong, multispectral light. The only portion of the light that matters is the light that affects the sensitizer and initiates the cross linking. Not the white and yellow light but the bright bluish purple ultraviolet light. Look at the histogram above for an L-1282 lamp from Olec designed for systems from 1000 to 5000 watts. The graph of the spectral output shows two strong amplitude spikes in the 400-420 nanometer wavelengths as well as the 350 nanometer wavelengths, which is optimal for emulsion exposure. If the graph showed actual light color, these spikes would be bright blue and purple ultraviolet light. The spectrum extends beyond the graph shown. To the left are shorter wavelengths that eventually become x-rays and to the right is the typical rainbow spectrum that we see as white light that eventually becomes red and enters the infrared wavelengths or heat. Emulsion needs strong 350-420 wavelengths, strong enough to penetrate the emulsion completely whether it is on a 350 mesh, a 25T, or a 400 micron thick film screen. If the light strength reaching the squeegee side is weak, or doesn’t have the right spectral mix, the screen tends to be below optimal exposure no matter how long you expose for. You can only make screens as good as the exposure unit light allows, it’s all in the physics of light. Perfect Screens equal near non-stop production, a poorly exposed screen assures stop and go production, or the difference between printing 250 pieces per hour or 700-1200 pieces per hour, depending on the indexing speed of your press. The end result of a good light source is shown above. Good light sources yield total exposure of the emulsion lm, whereas an inadequate light source will lose emulsion on the squeegee side and only partially cross link the emulsion. Lamps come in a variety of configurations from fluorescent to, Quartz Halogen, to Mercury vapor, to Metal Halide and all of these have different wattages and spectral outputs. Fluorescents - Most of these systems are just barely adequate to make screens for hand printing plastisol inks in the textile area with better models available for the graphics industry where better bulbs are often used. Their long exposure times make them a poor choice for automatic textile shops, and they tend to produce weaker screens that will pinhole and breakdown sooner. They can be used for short run waterbase and discharge but they will break down quickly. Since hand printing runs are relatively short they are ok for small shops but you cannot grow the business with them due to slow exposure times, poorly exposed screens that leads to press stoppage limiting productivity, increased rejects, and lower print quality. I recommend using a VNH BL350, or VNHFLS420 replacement bulb if it works in your fluorescent system. Available in 24, 48, and 72 inch bulbs. These bulbs do have good spectral output and can expose emulsion quite well, but exposure times can be longer than a 5kw Metal Halide and may not make screens as durable for waterbase and discharge ink systems. There is a huge output difference between these bulbs (VNH-BL350 or VNHFLS420) and the common FT40BL and Blacklights you can find at home improvement stores which do not shoot strong screens or expose thick stencils. There is a lot of mis-information available on the web regarding lights, again the physics of exposure is what matters not urban myths, and like the horsepower in cars, strength matters. 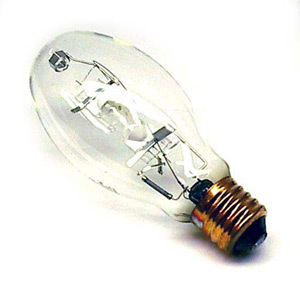 500 Watt Halogen - Quartz Bulbs - These lamps can be purchased at most home improvement stores and are sold as shop lights, replacement lamps for outdoor floods, or indoor lighting. They were never designed for screen exposure. Their spectral output is very limited. It is mostly white light and requires long exposures. While you can make screens with them the quality of exposure is inadequate for anything but hand printing. On automatic presses they will exhibit pinholes and stencil breakdown just like weaker fluorescent systems. The money you think you saved is lost in production and this light will not allow you to shoot strong thick films for high density printing. The longer exposure times undercut the art and details can be lost and difficult to wash out. High Density Screens? You can go to lunch, come back, and still not have an exposed screen! Beware there are exposure systems being sold that claim to be Metal Halide but are actually quartz bulbs. These are tungsten lament bulbs that are designed to produce bright white light. A histogram shows no spikes in the all important 350-420 nanometer wavelengths and most of the light energy is in the white and infrared (heat) regions. Quite commonly they are married with weak UV fluorescents to help them expose emulsion. Again these are entry level systems for the small hand printer not a shop that is growing or has plans for an automatic press someday, or wants to print specialty inks. 1000 watt Quartz Shop Lights - Inexpensive compared to a real exposure system, they are sold as shop lights, are used in parking lamps, outdoor lighting and they are really bright. Exposure times are long since the spectral output is poor with most of the light falling in the white light and infrared areas, none of which helps you shoot a good screen. Avoid them if you want to make screen printing a career, grow your business, or plan on adding an automatic press. Metal Halide Lamps are constructed quite differently than any of the previous lamps. They contain rare earth additives, mercury and Xenon gas to assist electrical flow. Not all metal halide lamps are created equal. The rare earth additives like gallium, iron or copper help the light spike at 350 and 420 nanometers. Metal halides created for general lighting do not have the same spectral quality of a lamp designed for emulsion exposure. Exposure lamps with balanced rare earth elements are the real deal. Generally they are found in industrial strength exposure units where 3k-8k output is common. For 1k systems, like the one pictured to the left, increasing exposure times will help achieve strong screens as well. Run an exposure calculator test or a wedge step test to find the time for your particular exposure unit. We use a 5kw Metal Halide (shown in the histogram below) as our benchmark for exposure tests and times. When emulsion is exposed to a strong high quality light the cross linking process is more complete forming stronger molecule chains that cannot be broken by squeegee abrasion, screen ex, or chemical interaction with harsh inks like discharge or for graphics strong solvent inks. The result? Better press yields, better pro t margins, and company growth. It should be noted that as good as these light systems are there are still important areas to be aware of. The light quality of these systems weakens over time. From day one the lamp starts to lose strength, but will always be better than any of the previous lamps. The simple solution is to use an integrator set to ‘units’ versus shooting by time. If you use seconds (time) instead of units (lumens measurement) on a system like this you will be underexposing your screens after about six months of shooting 20 screens per day. While the light may still be bright white light it will eventually lose its output in the crucial UV wavelengths as the rare earth elements are used up in the exposure process. So, if you have an integrator, use the units setting to compensate for ultraviolet light loss. When you install a lamp, or replace a lamp do a step test (How to do a Step Test), or use an exposure calculator to determine exposure times. On your integrator you can set 1 unit = 1 second. After three to six months measure the amount of time the exposure unit stays on in seconds and compare to your unit setting. Generally you will be exposing longer than when you determined the original time showing the lamp is aging. In some cases the exposure system will not shut off automatically. This indicates the bulb is used up; it is not putting out enough light in the 350-420 nanometer wavelengths for the light sensor to measure in units of light. So always use units instead of seconds to keep exposures consistent. If your exposure system does not have an integrator with a light sensor to measure lumens (units of light) use a hardness scale on each screen. When you have determined the proper time, via a step test or exposure calculator, place a hardness scale on the next production screen and note the hardness number for your exposure. Generally ‘6’ is a good exposure. Carbon Arc Lamps - These are old school pin point UV light sources that were quite common in the past. They produce excellent UV light by creating a gap between two copper covered carbon rods and owing low voltage high current electricity across the gap creating an ‘arc’ of light. Unfortunately the intensity can vary depending on the gap and the machine’s ability to adjust this gap through automatic controls. They also are very un-healthy and produce a thick acrid smoke that most states recognize as being harmful to the worker. Exposure times are calibrated with a step test or exposure calculator and the use of a hardness scale is recommended to evaluate stencil hardness. Pulsed Xenon - A pulsed Xenon lamp has instant on off capabilities. Unfortunately they do not expose diazo and bichromate emulsion well and they emit a lot of infrared heat which causes the glass in the exposure systems to heat up. They are primarily used to create plates for litho and have limited use in a screen print shop looking to succeed. Mercury Vapor - the main characteristic of this lamp is they are constantly on since it may take 3 or more minutes to reach vaporization of the mercury. Exposure Systems: Your exposure system determines your success in screen printing. Hi, i found this article excellent and gave a better picture of how screen exposure works. From options of light sources, why LED is not on your list?